In this episode I talk with Pete Matthew, who is a Chartered Financial Planner, a Certified Financial Planner and Managing Director of Jacksons Wealth Management from across the pond in Penzance, UK. Besides his day job, he also happens to host a top 5 business podcast in the UK with just under 1 Million episodes downloaded and has really cracked the code when it comes to podcasting. For those of you who have considered podcasting or are on the radio, you are going to love this conversation! We get into how Pete has transformed his podcast into a marketing funnel that currently drives over 25% of his business and generates 4-5 new prospects a week – make sure you don’t miss the story of Pete’s first podcasting client as it speaks to the power and reach of the medium. Then we dig in on how technology is breaking down the geographical boundaries for marketing and how Pete believes virtual appointments are 95% as effective as face to face. Next we dig into Pete’s 3 step framework for creating engaging content for his show. The great news is that it works just as well on radio. From there we spend some time on the problem with jargon in the financial services industry, the simple framework you can use to overcome it, and why it’s so important for creating a greater connection with your clients and prospects. Finally, don’t miss the secret Pete uses to engage with his audience to generate reviews for his show. It’s super easy and powerful! [00:03:10] Discover the power of podcasting and the incredible benefit of being able to connect with influential people from around the world. [00:06:00] Find out how his passion for teaching and lessons from Gary Vaynerchuk’s book “Crush It!” led to an inspiring 7 year digital journey that’s helping people understand money and succeed financially. [13:23] How has podcasting become Pete’s biggest source for client referrals and securing new business? [15:29] The step-by-step framework Pete uses to turn podcast listeners into qualified leads and why his clients love virtual meetings. [17:19] Why you no longer have to chase new business… Learn how “Attraction Marketing” is changing the game. You’ll have prospects banging on the virtual doors begging to work with you! [21:49] How asset managers and advisors can break free from the traditional “this is my territory” mindset and land high-flying clients who love the convenience of a virtual relationship. [00:28:33] Find out how technology and virtual transactions have changed the internal processes at Pete’s firm. [00:30:09] How financial advisors can transition from traditional radio to the world of podcasting and the critical factors to creating great content that speaks to your audience. [36:38] The 3 simple keys to financial planning and why great financial advisors should never worry about being boxed out by technology. [00:41:03] Why are so few financial advisors joining the podcast movement? Find out why it’s never been easier, learn to overcome your fear for compliance, and discover Pete’s top tips for podcasting success. [53:33] The importance of eliminating financial jargon and simplifying complex terms for your clients. [59:10] Planning on starting a podcast? Don’t miss Pete’s best practices for generating ratings and reviews and creating social proof with your audience. [01:05:59] What things does Pete hope are looked at as being absurd 25 years from now. [01:07:19] Find out why Pat Flynn is the first person Pete thinks of when he hears the word successful. [01:08:19] The one book Pete thinks everyone in the financial services industry should read. [01:11:52] A simple, yet effective piece of advice anyone can implement to be successful. Thank you so much (Adam B. C.) for taking a second to drop us a review, I really appreciate it. If you’re a loyal listener and haven’t given a review yet, I’d love if you’d take a quick second to do so as it helps me out a bunch! To make it easy, just go to bradleyjohnson.com/itunes and be sure to leave your Twitter handle in the review so I can connect with you there and give you a thank you shout out! [00:00:38] Brad: In this episode, I talk with Pete Matthew. He’s a Chartered Financial Planner, a Certified Financial Planner and Managing Director of Jacksons Wealth Management from across the pond over in Penzance, UK. Besides his day job, he also happens to host the top five business podcast in the UK with just under 1 million episodes downloaded and he’s really cracked the code when it comes to podcasting. For those of you who have considered podcasting or on the radio, you’re going to love this conversation. Here are just a few of the highlights. We get into how Pete has transformed his podcast into a marketing funnel that currently drives over 25% of his business each year and generates four to five new prospects a week. Make sure you don’t miss the story of Pete’s first podcasting client as it really speaks to the power and reach of the media. Then we dig into how technology is breaking down the geographical boundaries for marketing and how Pete believes virtual appointments are 95% as effective as face-to-face. Next, we dig into Pete’s three-step framework for creating engaging content for a show. The great news is it works just as well for all of you on the radio. From there, we spend some time on the problem with jargon in the financial services industry and the simple framework to use to overcome it and why it’s so important for greater connection with your clients and prospects. Finally, don’t miss the secret Pete uses to engage with his audience to generate reviews for a show, super easy and powerful. As a special gift for all of you Blueprint listeners since we spend most of today’s conversation on podcasting, I thought I’d make my step-by-step process for producing each week’s show available to all of you if it can help you on your podcasting journey. It’s a downloadable PDF with not only everything I do to record each show but each of the steps my incredible team of Charlie over at PodPostMedia.com and Amber and her team at InsightfulDevelopment.com do to get each show live. It’s available to download at BradleyJohnson.com/23 right there at the top of the show notes. As always, links to books mentioned, people discussed as well as a complete transcript of the show is available there as well. Be sure to stick around after the show because I’m going to steal a page out of Pete’s playbook and give a shout out to a Blueprint listener for a recent review. [00:02:38] Brad: As always, thanks for listening and without further delay, my conversation with Pete Matthew. 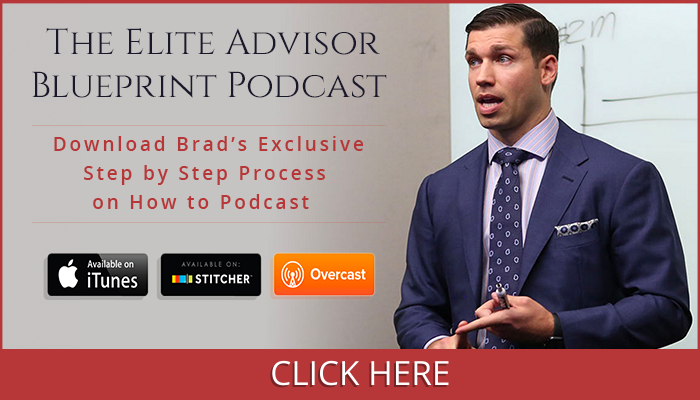 [00:02:46] Brad: Welcome, everyone, to this week’s episode of the Elite Advisor Blueprint podcast. I’m super excited. I have my first guest ever from across the pond, as they like it to say, Mr. Pete Matthew. Welcome to the show. [00:02:58] Pete: Hey, Brad. Great to be here, my friend. How are you doing? [00:03:01] Brad: I’m doing well. Excellent. It’s afternoon over there, right? [00:03:04] Pete: It is, yeah. Yeah, mid afternoon so after this I shall be going home to my family. [00:03:09] Brad: Very cool. Well, I just left mine to come at the show here so I’ll see them a little later on today. [00:03:15] Brad: I want to get right in because I have so many questions I just want to pick your brain with but I thought a fun way to begin this episode would be how we actually connected. So, your background, obviously you’re a financial advisor in the UK, and then you read this book by this guy named Gary Vaynerchuk that few people have heard of, Crush It!, which I love reading that because I’m a huge fan too and that’s a lot of what got me into this as well. And so, you start to podcast and we’re going to dig in there and I can’t wait to hear everything that that’s done for your business. But what’s funny is we wouldn’t be having this conversation if it wasn’t for your podcast and if it wasn’t for my podcast because I randomly connected with a guy named Adam Carolan who’s a mutual friend who runs a podcast. He’s just outside of Manchester over in the UK and it’s NextGen Planners, kind of for the younger generation of planners coming up in the UK there. How he found my show I have no idea but that’s the cool power of a podcast. You don’t know who’s going to listen to it once you put it out there. He had me on his show. He’s like, “You’ve got to meet Pete. He is crushing it over here with his podcast, Meaningful Money.” The next thing I know, we’re connected on Twitter and here we are having a conversation all thanks to a podcast. [00:04:28] Pete: It’s an amazing world. Isn’t it? We can connect across the pond and across the inter-webs and you meet kindred spirits, people aiming for the same things you are divided by geography but not by spirit. I love it. What an amazing time to be alive, right? [00:04:41] Brad: Yeah. Very. It’s crazy how it works. And so, I want to dig into that because you run a financial planning firm, Jacksons Wealth Management based at Penzance, UK. Am I saying that right, Penzance? tourist destination and not a clothing manufacturer. Land’s End is about 10 miles from my house. So, it’s the most southwesterly point of the UK so it’s a long way from anywhere. I’m actually from the North of England but I married a girl from Cornwall. That’s the county that Penzance is in and Cornish girls tend to always go home. We met at University. We settled in Cardiff in South Wales where we both went to university but as soon as the kids came along, the call back home became too strong to resist and so that’s how a northern boy like me, a city boy, ended up in the sticks right down in the far corner of England but it’s a spectacularly beautiful place to live, beautiful beaches and very quiet pace of life. But plenty of money down here as well so that keeps me active. That keeps me in a job. [00:05:43] Brad: You say the sticks in the UK. The sticks in Kansas is in the middle of a cornfield. So, it’s not right there on the coast. I watched the video on your website where you’re speaking with the ocean waves breaking in the background. I’ll take those sticks any day. [00:05:58] Brad: So, let’s go into I want a little bit of your journey. Obviously, we’re doing a show for financial advisors here in the US. So, you started and we don’t have to go back to the days of when you’re managing McDonald’s. I love that you put that in your bio. [00:06:12] Brad: But let’s start with you’re running your financial services practice and then you kind of get inspired by Gary Vaynerchuk and let’s just take that journey of MeaningfulMoney.tv and where that’s taken you so far. [00:06:24] Pete: Cool. Absolutely. Yeah. I follow the classic career path. So, from McDonald’s, which was not compatible with the newly married life, I joined an insurance company and we call it industrial branch over here. It’s now no longer a thing but here in the UK, it used to be that insurance agents would go around an area, a geographical area and call on people’s homes once every four weeks and collect life insurance premiums as well as latterly, car, property insurance and things like that. So, that’s how I got into the financial services world, got through the basic exams, joined another insurance company then became what we call an IFA, an independent financial advisor, in other words, not working for a particular product provider or investment house. And then just combination of circumstances, ended up in 2005 joining Jacksons as an advisor, self-employed under a Jacksons banner and bought into the company in 2007. So, I’ve been a director and shareholder here now for 10 years this year and glory in the title of Managing Director which means that I really set the direction for the firm but I’m one of four owners of this firm. My best friend, Roger, is our Finance Director. Chas is sort of sales, marketing and people really. And Mike is the sort of senior guy who’s the sort of chairman who’s in his early 70s now but just so a powerhouse of information. So, we’re a good team. It’s a great business. We’ve actually been in business for, well, since 1923. I can’t even do the math, 94 years. We can trace our roots back in this town. So, it’s a great place to live, a great place to work but it kind of wasn’t enough. I love what I do. I love financial planning and what it enables people to do. For me, sitting the CFP license, the Certified Financial Planner license in 2006 was a watershed moment. That’s rare here in the UK that most people, most consumers here in the UK don’t know what a CFP is. We have something called Chartered Financial Planner which is also CFP. [00:08:20] Pete: But the CFP, the International Standard Certified Financial Planner is relatively rare here but for me, it was the application of everything I’ve learned in the previous sort of 10 years in the industry and was a watershed moment. And since then I’ve been trying to build a financial planning practice so now all my clients are full financial planning clients. But it still wasn’t enough. I’d seen the benefit of financial planning for ordinary people, what enabled them to do, how it provided the framework for them to make financial decisions and yet there’s only so many working hours in a day, 9 until 5 or whatever, 9 until 6 and I wanted to get the message out to more people. I wanted more people to understand the power of really very simple financial planning. And also understood that we as an industry, as a profession, we make financial planning more complex than it needs to be for most people. So, this sort of thing began to sort of percolate within me. I had a sense that I wanted my legacy to be more than just helping rich people get richer. There’s nothing wrong with that. I don’t have any moral issue with that. It’s all that pays the bills very nicely but I wanted to be able to do more with the knowledge that I had and the passion that I had. So, that was sort of 2008, 2009 that those feelings started to surface and develop. Around the same time, various people in different parts of my life told me that I was good at explaining things. So, that went from a church setting where I would often sort of preach to I was a governor of the local school. Obviously, day-to-day as financial advisors, we explain stuff to our clients every day and even at home around the dinner table with the kids my wife would say, “Gosh, you know I never would’ve thought of putting it that way. You explained that very well.” And if enough people say something to you, you start to believe it, right? And so that happened and then the clincher, as you say, Brad, was reading or rather listening to Crush It! by Gary Vaynerchuk which I think it was 2009. Maybe it was released in ‘08 but I absolutely listened to it on an audible, on an audiobook. So, I actually began with video and I bought a Flip video camera, one of these little cameras by the size of a pack of cigarettes and just set it up on the promenade down here in Penzance very early in the morning so nobody would see me. It’s a windy day. I mean, the video I still have it. It’s pretty dire. The audio quality is awful and the camera is shaking. But I just set this camera up and told it what I was going to do. I said I’m going to talk about money, how it works, everything you need to know and everything you need to do with your money to succeed financially. And just sort of carried on from there really. I ended up doing 300 videos and then latterly, as we’re going to talk about, jump into podcasts. So, yeah, it’s funny. It’s now, what is it, 2010 actually went live. It’s seven years this year. I don’t know where the time has gone but I’m still having a whale of a time doing it. [00:11:45] Brad: How long ago did you switch from doing all video to incorporating the podcast? How long has the podcast been around? [00:11:51] Pete: Okay. Yeah. So, I put my first video live and the website went live in April 2010. The first podcast was November 2012 so two-and-a-half years later. In that first two-and-a-half years, I did nearly 300 videos. At one point, I was doing three a week. I can’t member how now. I just was churning them out at an incredible rate. Did, yeah, 300 videos but in that time, began to fall in love with podcast as a consumer listening to Pat Flynn and Cliff Ravenscraft and Michael Hyatt and Michael Stelzner of social media marketing world. Eating all these sorts of things, I started to become a consumer. I love the medium and thought actually I could probably do more with that medium than I can with video simply because of the attention span. So, I thought, “Why don’t I have a go?” And November 2012, put out the first one. I sort of what we call faffed around with it for a while. I didn’t really take it seriously. I think I did 12 or 13 episodes in six months and then said to myself, “Look, if you’re going to do this, you need to really do it and go weekly,” and have missed very few weeks since then. And have now done I think 208 podcast episodes. [00:12:58] Brad: Yeah. I just pulled your stats off here. I love how you have them on your website by the way. So, if anyone wants to check it out, MeaningfulMoney.tv, and just under a million downloads. [00:13:08] Pete: Yeah. I’ll hit a million by July I think, July or early August, yeah, so that’s going to be a celebration. [00:13:14] Brad: Where’s the party? Can I go? [00:13:16] Pete: Yeah. Absolutely. There’ll be a nice bottle of champagne I think. [00:13:21] Brad: Very cool. So, just because I know sometimes financial advisors tend to have short attention spans, let’s talk about results in advance and then we’ll talk about how you got there. So, I know in a conversation we had when we’re kind of hashing out what we wanted to talk about, this has become a marketing funnel for your financial services practice now. And so, let’s talk on the results of the podcast. Are you getting an inquiry per week, two, three, four? What does that look like? [00:13:50] Pete: Most days I get an inquiry now. Not every day, but say on average two every three days, something like that. Of those, I probably take on about one in five as clients but that’s simply because of capacity here so I tend to cherry pick a little bit. Some of those inquiries are people who are just getting started with saving. We call them HENRY’s here, high earners, not rich yet. HENRY, right? So, these people don’t need financial planning yet. They just need to get going and start saving and investing and I tell them that, point them in the right direction. But of course, occasionally, not occasionally, relatively frequently a really ideal client to me comes along and gets in touch. So, to put some numbers on it, it took 18 months after the first video in April 2010. It was August, September 2011 when the first client approached me quite out of the blue. I’ll come back to that story later because it’s a good story but since then it took them until 2014 for Meaningful Money to become the biggest source of new client inquiries here at Jacksons. Now it kind of lies relatively equally between that and client and professional referrals. Any healthy professional practice gets its good share of referrals and so we still bask in that as well but the internet now, Meaningful Money specifically, is now a major source. Either number one or two sort of lies there about with referrals. So, I mean, my personal contribution to the turnover of the company is about a third now and of that – certainly, in terms of new business, about 20% to 25% of new business since my practice is now directly from Meaningful Money. [00:15:30] Brad: Wow. What’s the framework if we broke down the steps? I listened to your podcast, Pete. Now how do I connect with you? Are you telling them on the actual show? Are you saying, “Go to my website. Connect with me here?” What does that look like? [00:15:42] Pete: Yeah. That’s essentially it. I’d love to say there was much more complex and thought through than this, Brad, but it’s actually very simple. So, I might be explaining something. Maybe I’ll do a podcast about new pension’s rules here in the UK and I’ll say, “Look, I told you what you need to know and what you need to do but this is complicated. It might serve you to get good advice here.” So, I actually have some space in my client roster right now. There is a button on the website that says, “Work with Pete,” and all it does is sends me an email and sends me an email and they, in the body of the email, tell me what they want and it comes straight to me then I respond and then we book them in. Very often because of the source, they are remote from where I am physically. So, I’m in the far Southwest of the country. A lot of my listeners are in the Southeast around the London and the home counties areas. So, I’ve had loads of clients that I’ve never met and it’s all been done via Zoom or Skype Video and clients love it. I think because they find me via the online medium, they’re happy to work with me that way too and we found ways to get over some of the shortcomings of a virtual meeting but generally, it works really, really well. And two or three times a year I will fly up to the Southeast, hire a car and drive around in for a week and see some of these people in the flesh as well. So, but it works really, really well but it’s as a simple as that. They get in touch via the website and ask will I work with them, then the process is much the same as if they walked into my office or picked up the phone. We vet them as future clients. Do we want to work with these people? Do we like them? Are they the kind of clients we can add value to? And the process continues as normal. [00:17:15] Brad: I don’t want the listeners to miss that. They ask if you will work with them. So, let’s speak to the difference between maybe traditional marketing funnels like public seminars, things like that, where really the advisor’s chasing the client as opposed to this is they’re coming to you and saying, “Hey, Pete. I’ve listened to your show a couple of times or probably a lot more than that. Will you work with me?” So, how has the show changed the dynamic of how a client interacts with you or a prospect as you say? [00:17:41] Pete: Yeah. Massive. I’ll tell very briefly the story of the first ever client because that was what clinched it for me. Eighteen months of doing videos, never intending that it would become a business source. I got an email out of the blue from a couple who lived 350 miles from me. That’s a long way in the UK. [00:17:58] Brad: It’s a long way, buddy. And I sat back in my chair and thought, “Man alive, this is totally different from how it’s ever been.” Usually, at best it’s, “My friend says you’re a good advisor,” and that’s about as warm as it gets but I’d never pride to that point until he said, “Will you, please, work with us? We feel like we know you already. Please, will you work with us?” And that now happens all the time. And to say that’s a change of dynamic is a monumental understatement. It’s a huge deal. This is the world now of attraction marketing. It’s about putting yourself out as somebody, A, who knows what they’re doing but that’s just the price of entry, man. If we’re not experts then we shouldn’t be practicing. But it’s more about putting yourself out as a personality, as a level of ethics that you clearly adhere to because you have a consistent message and preaching the same stuff and being yourself and being human, not putting on a facade. People can see through a facade very easily these days. And people warm to it. [00:19:49] Pete: Now there is something about the power of podcasting. The fact that you’re talking directly into people’s ears and doing so for half an hour a week every week. They feel like they get to know you. I have a guy ring me up today and I said, “Cool. I feel a bit star struck,” and I said, “Don’t be ridiculous. I’m just a guy in Penzance talking into a cupboard,” and yet he thinks I’m some kind of celebrity. I just think it’s hilarious. But what a great world. And he was so cheerful because he emailed me with a question and I said, “Ring me now. I’ve got five minutes. I’ll answer your question on the phone.” And he can’t believe that I did that. But that sort of desire to help, that passion for your subject comes across and so it becomes attractive and that’s what makes people get in touch. [00:20:27] Brad: Yeah. That was so cool. So, let’s dig into a couple of things there. The first one is and I’ve dealt with this. I mean, probably my average client’s age is mid-50s as I’m sure financial advisors in the UK is probably a higher age demographic. If you just took the average age range of people that are reaching out to you from your podcast, have you seen trends there as far as typical age? [00:20:50] Pete: Yeah. It’s trended slightly down. I’m fairly sure for good professional advisors across the world most clients and I say the sort of time where advisors can have the most value is sort of 45 to 60. It’s in the runup really to retirement, whatever that means, for a particular client. And so most people who I’ve traditionally got in touch have been mid-40s and above. There is a bit of a trend down I think since the podcast so I’m getting more people in their mid-30s, maybe people who are just now having children and realizing, “Okay, we got to factor in education costs here. We got to factor in what happens when they fly the nest. How long will we have left before our pensioning comes kicks in?” all that sort of stuff and really trying to plan. Even though it’s maybe 20 years out, they want to start thinking about that stuff now. But there are still plenty of people in their 40s and 50s who are approaching me. So, it’s a slight trend down but not a massive difference. [00:21:49] Brad: Well, and that kind of takes me to my next question here which it’s crazy to me. I mean, you’re in the UK. I’m in the middle of the US here in Kansas. We’re having an incredible conversation here. Technology is amazing. And what’s been interesting though, financial services have been so slow to embrace technology and I look at it like even as I consult my clients with how they market, there’s this mindset of this is my territory. So, here’s my brick-and-mortar office. It’s on this corner and here is the radius around these ZIP codes that I’m going to target and whether that’s direct mail, whether that’s a radio show, a terrestrial radio show that kind of blankets their area or even referral events or different things like that. And in today’s world the way I look at it, in the UK, the entire UK is your market, right? [00:22:41] Brad: And in the US, the same thing. Your market especially if you’re an asset manager, they can manage assets for people in California just as well as in New York. [00:22:50] Pete: Yeah. The world’s changing. [00:22:51] Brad: Yeah. So, let’s speak to that because, I mean, your very first prospect that reached out to you from the videos was 350 miles away and now you’re saying you’re getting these inquiries from all over the UK, people you haven’t even met. So, how has that changed your marketing dynamic? I guess, what did you figure out as you started to find more and more of that? [00:23:09] Pete: I suppose I’d figure that but actually this kind of virtual video face-to-face is 95% as good as in real life very often because it’s so good now. I remember the internet when it was tiny little videos, this size, and say Frank talking to me and scratchy quality and all that sort of stuff and the technology is there. So, we’ve got good broadband, we’ve got good bandwidth speed so that’s all fine. I can share my screen. Everybody’s got decent sized monitors now so I could share my screen if I’m doing a Voyant financial plan with them. You guys have Voyant over there. I think it’s an American company. It’s the financial planning software so I could share my screen with them. I’m talking through the process live. [00:24:38] Brad: He’s a real DJ. [00:24:40] Pete: He’s a proper DJ. This guy is a legend in his particular field. He found me because audio is his thing, right, and he loved it because, I mean, he’s a night owl. He’s DJing deep into the night. He doesn’t get up before 3 in the afternoon and he would Skype me from this airport lounge and I would have a planning conversation with him while he is waiting for his flight and he just loved it. He thought that was great. Another example is, again, in the same conversation I asked the prospect, “What is it that you do? She said, “I’m a company director,” so okay and so that doesn’t help me very much. “What does your company do?” And she told me I won’t say what it is but it turns out she’s a board director of a FTSE 250 company. So, it’s one of the 250 biggest companies in the UK and if I said the name of the company everybody in the UK would know who it was. So, I pick up these clients. These are highflying clients with very little time. They love the fact that they don’t have to arrange a time to see me very often or we can do it virtually. They can be on a plane, in an airport lounge. It can be in a train waiting room and have a conversation with me because I’m happy to deal with them virtually and that’s still unusual in the UK. You said it right, financial services industry is very slow to catch up with this stuff. [00:25:52] Brad: So, I want to make sure I didn’t mishear you. You’ve done virtual meetings with clients that are literally up in the air flying on the airplane Wi-Fi and you’re doing a meeting with them? [00:26:03] Pete: No, not flying. I’ve done the meeting in the airport lounge so they’ve been waiting for their flight. [00:26:09] Pete: That would be cool. [00:26:10] Brad: To a whole new level there. [00:26:12] Pete: Yeah. When they’re sitting on their Learjet and I’m having a conversation then I know I’ve made it. [00:26:24] Pete: Yeah. Michael Kitces, yeah, a legend even in this country. [00:26:27] Brad: Yeah. Very cool. So, he even talked about how Alan when he moved and he trends a younger clientele, probably more millennial, but he said one of the things that he found in his mind it was my clients are not – where did he move from? I think Atlanta to Milwaukee or something like that. He had to go virtual appointment by necessity and what he found was clients actually enjoyed it more because, I mean, I think about it right now. It’s a pain to drive across town even for a doctor’s appointment or whatever. If I could just sit in my living room in my pajamas with my slippers on and just pull up a meeting just like we’re doing right now and accomplish that, that would be a thousand times better than the typical process that financial advisors do. [00:27:12] Brad: So, have you gotten that feedback from your client as well? They actually decline in-person appointments to do virtual? Have you seen that? [00:27:18] Pete: Yes. I mean we still are a brick-and-mortar practice so we still have lots of local clients and they still come in to see us. We even still got to go out and see them. If they’re elderly or can’t make it up the stairs to our office or something but most of my new clients love the virtual thing because it just fits around them. So, often I’ve met with couples and they’re in two different places. She’s at work, he’s at work or he’s at work and she’s at home with the kids but they could both log in. I use Zoom as well, the technology we’re using now to record this, and they can both log in from their own iPad or computer from different places and it’s like being in the same room. The system is so good. So, it just works brilliantly. People love it. It saves very often. I’ve got several people in mind as I’m talking to you. It saves maybe the guy having to rush home or finish work early so that they can be together. Teatime, I’m not sure if you call it that there, teatime, dinner time when the kids are fractious and the last thing you want to be doing is meeting with a financial advisor. Instead, we can do it at lunchtime. He’s at work, kids in bed having a nap or whatever and she’s got time as well. It just works brilliantly, so much more flexible. I’m with you, man. If I could sort of be virtual for most things in life I’d be happy. [00:28:31] Brad: Yeah. How has it changed your internal processes at your firm as far as the technology of interacting, transferring assets? Any big leaps you had to do when you took appointments virtual? [00:28:42] Pete: Now one of the biggest things we have to do, we have to jump through various hoops for anti-money-laundering purposes so we have to be careful to identify clients properly and make sure that we see various forms of ID but, as ever, services have sprung up now which enable us to do that with electronic searches so credit searches, voters roll searches, things like that so that’s one change we had to do. In the early days, I had to get people to take their passport, their driving license to their local attorney or the post office to get them stamped as copies of the originals and send me the copies rather than commit those documents to the post. Now I don’t have to do that. A couple of clicks and we can identify that these are the people that they say they are and that they do live where they say they live and it all sort of stacks up. So, that was easy. Obviously, you can’t get clients to sign physically a document when they’re not in front of you so adopting things like Adobe EchoSign and there are some other alternatives as well, virtual signing. We still, I say we, the industry providers here very often still require a wet signature so we sometimes do have to send forms out for clients to sign and send them back. It adds an extra step. Clients don’t mind. It arrives in their post. It’s all flagged, “Sign here, here and here, and here’s envelope to send it back.” It just works. I mean as much of that stuff as we can do via email then we do but a lot of the providers still require wet signatures. So, it’s just admin changes really, Brad. Nothing too significant. [00:30:08] Brad: Cool. All right. So, let’s get into the depths of podcasting. So, in the US we had a conversation, Pete. You said I think you can count on one hand the amount of fellow financial advisors and podcasters in all of the UK that you’re aware of. [00:30:23] Pete: Out of about 25,000 advisors I think, yeah, I know of one, two, three, four including our mutual friend, Adam Carolan, who are actively podcasting. And of those, only three, yeah – well Adam is primarily an advisor rather than public. The two of those I can think of are in doubt the public like I am so that’s three really which is incredible. Out of a field in the UK, about somewhere between 20,000 and 25,000 advisors. [00:30:50] Brad: Well in the US I can think of one mutual friend, Jeff Rose, that podcasts. Good Financial Cents is his blog but it’s probably on the same count and I think there are substantially more financial advisors in the US than the UK. [00:31:01] Pete: I’m sure. Yeah. [00:31:03] Brad: So, with that being said, I’ll give you a breakdown of what our typical clients do and then I’d love to hear your feedback on how they can transition into podcasting if they were so inclined. So, a lot of our clients are what I say more traditional marketing so they’re doing public events like seminars. We’ve seen a huge trend into terrestrial radio. So, local news talk radio. They’ve got an hour show and driving a lot of business from maybe a weekly hour show which is not any different than a podcast really. It costs a lot more and you have limited distribution. So, for financial advisors doing radio shows out there, they’re already putting in the word, they’re putting out the content, could you see it being as easy as here’s my one-hour show assuming it’s okay with the radio station. I just take that and turn that into a podcast and distribute that basically across the whole country? Or is it more complicated than that? What would be your advice, I guess, would be a better question. [00:32:02] Pete: Yeah. I don’t think it needs to be more complex than that. If the content is good and if it’s good enough to be on a radio show, surely, it’s good enough to be on a podcast. Then I would definitely package that up. I mean, we have to understand is that podcast is simply a delivery mechanism for an audio file. That’s all it is and the mechanics underneath are now all done for you really. So, what you need to do is get to the point where you got a good audio file, an MP3 file, which is packed with good useful actionable content and then deliver it on a podcast. And then, of course, the world is your oyster. I’m limited in that I can only advise clients here in the UK but, I mean, there’s still plenty of clients to go around, right? But other than that, I don’t think we need to overthink it. If the content is good enough for a radio show, it’s definitely good enough to deliver in a slightly different format using the Internet rather than the airwaves as such. It really is all about content. The one thing that I’m pleased to say I did from day one, although I would be wrong to say that I planned it flawlessly, it was more by luck in judgment which is true of a lot of what I’ve achieved really, is that I gave the show a structure and I mentioned before already everything you need to know and everything you need to do. So, the show is broadly split into two halves. Everything you need to know first, whatever the subject of the day is, “Look, this is what you need to know. Here are three or four things you need to keep in mind as we talk about the rest. And the rest is what you need to do. Here are the action steps you need to take. Out of this, go online and do this, use this calculator to work out your net worth in the future.” Just different advice. All that stuff. Clear action steps what you need to do and people love that because they know they’re going to be able to move forward. I think the show which is just chat with no clear structure and with no actionable points might struggle a little bit more unless it’s inspirational which is another key factor. [00:33:58] Pete: I think – sorry. I sort of go round the houses but I think if any piece of content can, A, educate, B, sort of entertain. I think it needs to be interesting and amusing and easy to listen to. And then thirdly, inspire to take action. I think any two of those three is probably okay but if you can nail all three of those, educate, entertain and inspire to action, if you can nail all three of those in one piece of content or one content medium like podcasting in a channel or whatever, a YouTube channel, then chances are you’re going to succeed. You just need to get it out there because if it’s good, people will consume it. [00:34:36] Brad: Well, you answered my question. I was going to ask you how you know if it’s good content. So, is it simply that for you? If you can go down and check off educate, entertain and inspire then I’m going down the right path? Or is there more to it than that? And so, I get emails every day from people saying, “Look, I thought I was fairly sorted but I keep having epiphanies when listening to you that I need to sort this out and I need to sort that out.” And they email me all the time just to say thank you and they leave reviews on iTunes to say, “Look, thanks for putting this stuff out because I have now cleared all my debt and I’m saving into pensions for the future. I’ve been able to save a deposit for a house purchase.” All these things, it’s great to have read that stuff. It’s only because I’ve inspired people to take action as well as giving them what they need to know and giving them what they need to do. I’ve said to them, “Look, go do it because it will make a difference,” and that comes across in your personality and the way you deliver I think. [00:36:10] Brad: So, let’s go to that. I love the simple framework. Here’s what you need to know and here’s what you need to do. So, is your framework on the need to do, here’s what you need to do on your own but if you need help, reach out to our firm? Because you’re empowering them to do it on their own but if they need a coach, for lack of a better term, we’re here for you essentially. [00:39:05] Brad: And it’s so funny. I mean look at the US and the probably billions of dollars that people spend on weight loss supplements and all this stuff where in reality we know exactly what it takes. They burn more calories than you consume and basically probably do some sort of physical activity and so it’s how you eat and it’s how you burn calories. And for some people like you said, they just don’t have the accountability to actually show up at the gym or the one who is there. And so, hire a personal trainer, right? And it’s no different in financial advising. If you don’t have the self-discipline to do it yourself, hire a financial advisor to help you along the way. [00:39:45] Pete: Yeah. Absolutely right. [00:39:46] Brad: You show up at the gym, right? [00:39:48] Pete: Yeah. Well, I read a book on this, man. Looking here, you’re incredibly handsome and in excellent shape. I’ve always struggled with my weight and I know exactly what I’ve got to do. I read loads of books, I’ve have cookbooks and everything but I’ve hired a coach now literally only in the last six months to help me persevere, to hold me accountable and I do that for my clients. I don’t know why it took me so long to realize that I could probably do with this myself. And you know what, she lives about 300 miles away from me. We do it via Skype every other week. It works perfectly and she’s really helped me. [00:40:19] Brad: And I’m assuming you’ve seen some results? [00:40:22] Pete: Yeah. Then she’s been very patient with me. I don’t imagine I’m the easiest person sometimes because I tend to achieve a lot in other areas and this has always been historically the one area where I let myself off too much but I’m 42 now, on the wrong side of 40 so I need to start taking better care of these things. So, she’s been really helpful. Yes, I’ve seen some results. Lots more to come. [00:40:44] Brad: It’s not easy with kids, Pete. I know that. [00:40:47] Pete: Yeah. Mine will be older now. They’re 17 and 14 but still, yeah, life is busy. And it’s one of those things that I just let go but she’s helping me and it’s what I do for clients. Yeah, they’re busy. I can do a lot of the thinking for them and a lot of the doing for them and they love it. [00:41:02] Brad: Very cool. So, let’s get back to this. There are four advisors in the UK that are podcasting. Why are there so few advisors podcasting when, I mean, it’s like one of the coolest things I’ve ever done in my life? We would not be having this conversation if I wouldn’t have just jumped in and experimented with this medium. So, why do you think there are so few financial advisors podcasting? [00:41:21] Pete: I agree, man. It feels like an event whenever I turn on this microphone and then I put on my lights here. I’ve got a little booth built so it’s soundproof and it feels grand. I love to do it every week. There are various excuses thrown at me. The one which annoys me the most is time. It’s like, yeah, okay. Some people will say to me I’ll be presenting to advisors and they’ll say, “Pete, how long does this take you?” and I’ll say, “Well, I don’t know, five, six hours a week maybe total writing time and prediction and things like that.” And they say, “I could never have six hours to spend on that as well as running my practice.” And then I’ll listen to these same people out in the sort of in between times in their coffee break and they’ll talk about they watched the football match yesterday or they went to play golf yesterday afternoon. There’s nothing wrong with those things but you make a choice, right? You make a choice as to how you spend your time. I just don’t believe not having enough time is a legit excuse. There’s plenty of people who can help you with the mechanics. So, time isn’t an excuse. Knowing how really isn’t an excuse these days. The technology is fairly effortless and there are loads of people willing to help you, for a relatively low cost, put together the stuff together and lots of services. But I think probably the biggest fear is falling foul of the regulator or what you and I would call compliance. And I think certainly in this culture, I think it’s a monumental red herring. You know that the expression? It’s just something which is so irrelevant. Now none of us want to fall foul with the regulator but my view is you have to be really stupid to fall foul with the regulator, okay? So, a simple rule of thumb like don’t say anything on a podcast that you wouldn’t have printed on a billboard outside your office. So, here we are regulated on products primarily so I cannot say, “Here is a great fund from Vanguard or Fidelity.” That would fall under what we call a financial promotion here because I’ve mentioned a specific provider. [00:44:06] Brad: Now just to be clear here, would you be a registered investment advisor? Is it the same in the US? [00:44:11] Pete: Yeah. Kind of. Yeah, that’s probably the nearest equivalent I think but we call it directly authorized but there is another method of being authorized here in the UK through, essentially, I call it a parent company. So, that might be a compliance service that you have chosen to employ or you might work for a big national firm and there is a compliance department. I spoke to advisors who have to sort of pre-comply any tweets they send out. I mean nothing’s ever going to get done. So, the danger there is that you’re afraid of that and therefore you just don’t do it. But like anything, if you think it’s worth doing, you find a way around it. I’m fortunate I’m directly authorized. I am the compliance officer for my company so I just ask myself, “Do you think this is a good idea? Yes, I do.” And so, there’s no great long decision-making process but I understand that not everybody is in that position. But I think compliance is just not something to be worried about. And in fact, it’s something to be embraced and can just keep you on a straight and narrow. It’s just obvious to me. So, these are hurdles. [00:45:12] Brad: I love the rule of thumb. Would you print this on a billboard directly outside your office? I think that is going to steer you so far in the right direction you’re good in almost every single chance to have to go the wrong direction. [00:45:25] Pete: There is a platform here, an investment platform provider, a company called Nucleus. And I spoke to their chief executive about their social media policy and their content policy and he said, “Sure.” He said the policy runs to many pages but he said, “Whenever somebody new joins us, I explain the policy in three words.” He said, “Don’t be stupid.” And if you can adopt the mantra of don’t be stupid with everything you’ve got online then you’re probably halfway there. But the billboard thing works for me. Would I want the regulator to see it? And if I think the regulator would have any doubts seeing it in print then I don’t say it in audio. It’s just obvious. [00:46:04] Brad: Yeah. Well I even want to go back to, okay, so why do financial advisors not have a podcast? And, time, I get it. Everybody has limited time. And I wouldn’t have a podcast if it took me five or six hours. No offense, Pete. [00:46:18] Pete: No, it’s fine. [00:46:19] Brad: But one thing, I mean, there are services out there. Now I’ve got a great guy named Charlie. He’s out at Canada and essentially this is my work. My work is I want to have a great conversation with Pete and then I upload the audio, the video to Dropbox and he goes to work from there, helps me straighten up show notes. And so, I even think as a financial advisor, if your time was just having a great conversation or as you said, educating, entertaining and inspiring with whatever content you want to put out there, as long as you can do that, you could have a podcast today in my opinion. [00:47:36] Pete: Not being consistent. So, I did 13 episodes in six months and with different gaps between them. I have a three-week gap and then I do two in one week and things like that. Just that’s not the way to do it. People expect consistency. I had a fortnightly. I think the optimum is weekly for podcast, personally. As soon as I went weekly, I noticed a significant uptick. I mean the graph is ridiculous. I’ll show it to you. But, yeah, being consistent I would have at least 10 episodes prepared in advance before launch now so I would probably have three in the feed ready and seven or somewhere near that ready to go into the feed so that I was well ahead. I’ve never more than a week ahead with my podcast. [00:48:20] Brad: So, just to break that down, because we’re going to have some podcasting work. He’s listening in here. You’ve got 10 episodes cut and then you’re immediately going to drop three that go live right away? [00:48:30] Pete: Yeah. Three or four because people will, if there’s just one episode, they hopefully would be wanting more so if you give them two or three your best episodes right at outset, it really sets the precedent for what’s going on. They’ve got three to listen to in the first week assuming they find you on day one and then your fourth episode goes live from the next week. And you’ve got some in hand and you got a buffer so you can go on holiday and you can still queue up episodes while you’re on holiday and things like that. So, yeah, a weekly schedule, having some in-hand before you launch. You and I have talked in the past about good SEO. iTunes, remember, is still a search engine. You gave me a tip which I can’t believe I haven’t done which was to put the words financial advisor in the title of my podcast. About 18 months ago, a little more than that, perhaps two years ago I realized that I didn’t anywhere have the words personal finance in my podcast title and description. I did that. So, put those words in, immediately experienced to something like a 20% uptick overnight in listings because that’s what people are searching for, personal finance. I had money but I didn’t have personal finance. So, these are simple SEO tricks that you can do just to get people to find you when they search. I think if I was going to launch now I would put out all the stops, recruit all my social media followers, email everybody I knew, “Please, leave me a review in the first week so that it gets noticed by the people at iTunes.” iTunes is still a primary delivery medium and it’s a black box. Nobody really knows what goes on under the bonnet but we do know that there are people watching, numbers of new subscribers. Even things like podcast artwork, getting a podcast artwork done well from day one so that it stands out. You got a little icon and on iTunes, it needs to grab attention. So, all these things stack up and doing some of the things I did do like having to place a structure for each show. [00:50:25] Pete: I now use a seasons format so I tend to deal with one subject at length over a period of 6 to 10 weeks. One aspect of it per week but then that season is almost self-contained. So, I’m about to start one which will be the personal financial audit so basically, you can audit every aspect of your personal financial lives and there’ll be 10 steps in that. So, people can do the whole thing or they can just do the best that apply to them and I think that hopefully will be helpful. I’ve done a seasonal behavioral finance. All that sort of stuff. That’s really worked well for me as well. That’s led to an uptick in downloads. [00:51:00] Brad: On that, are you bringing in subject matter experts when you’re hitting some of these different topics? Are you interviewing them or is it always you? [00:51:07] Pete: A bit of both. It’s probably two-thirds me, one-third others as an interview like you and I are doing now. So, the Behavioral Finance season, I had a guy called Greg Davies who’s a big player in that field here in the UK and, yeah, different things. But, yeah, I do bring experts in. This is rather for that particular subject. [00:51:26] Brad: And you went to a seasons format just so you could hit specific on those topics to where your listener knew we’re going deep in behavioral finance. What was your purpose for going to see them? [00:51:37] Pete: Well, I’ve done I think 163 episodes and when I started, I had a clear path so I knew roughly what the first 50 episodes would be. I knew that somebody starting from the beginning would have a clear path to walk through but eventually, near to the end of that you start scratching around a little bit for subject matter. There’s always questions coming around email. There’s always something going on in the news which might need to comment. So, there’s no shortage of material but it became a little bit fractured. One week I’ll be talking about life insurance and the next I’ll be talking about the impact of the Eurozone crisis or whatever. And it just became a bit fractured. So, by reverting to a seasons format, at least I can say, “Right, I’m going to deal with this at length. I know where I’m going. People know where they’re going.” One thing I haven’t done yet is release them a separate podcast which I may well do and actually just release a 10-episode podcast to iTunes, optimize the name and the description and everything for that particular subject. I haven’t done that yet but I have the means to do so. I just need to get around to it and dump them into iTunes as a self-contained podcast as well. [00:52:50] Brad: If you ran with that strategy, Pete, you would release it let’s just say the behavioral finance, you would say here’s 10 episodes. You’d call it behavioral finance 101 for UK investors. That just makes sense. But then you would also still release them under your normal Meaningful Money feed as well? [00:53:05] Pete: Yes. I would. That’s the plan. I do intend to do that but I’m intending to do it for about three months. I just haven’t gotten around to it yet so time again. [00:53:17] Pete: Yeah. Something like that. Yeah. Michael Hyatt was actually the inspiration for the seasons thing. He switched to a season format a couple of years ago now and he enables them to batch. I’m still not doing that enough but the batching and then doing a whole lot of recording in one go I think makes sense as well. [00:54:17] Brad: I mean, even simple ones that we think like IRAs and Roths and things like that in the US over a lot of people’s heads. So, basically your wife is saying and a lot of people that you know you have this knack at simplifying and teaching things that are complex. Do you have frameworks you use there or maybe some examples of breaking down fees that you’ve used that have been really successful with your clients? [00:54:38] Pete: Yeah. I’d love to say it was that deliberate and it’s one of those things that clearly teaching is in my blood. My father was a teacher and then became a minister and was always a teacher from the pulpit as well rather than a preacher. He would explain and expound the Scriptures. So, teaching is in my blood definitely. I just can’t understand why anybody would use words that the person you’re speaking to and aiming to influence won’t understand. I mean, you might as well be talking to a wall. So, why would you not explain everything which might possibly need explaining? Even if it’s sort of you mentioned one of your acronyms there, even if you say, “Look, perhaps the best thing we need to use here is a Roth IRA. Now what that means is,” and a very quick explanation, “What that means is and here are the benefits. This is why it needs to be a Roth. Now don’t worry about the fact that it’s called a Roth. It’s just a tool that we’ve got to use. It could be a hammer or a screwdriver. It’s a tool I will use to help you build wealth but this is why,” and I simply explain all of it rather than just assuming people will know that. Even the fact that you asked that question, I want to smack my head against the wall because I just think, “Why would you not explain that? You are shooting yourself in the foot by doing so.” I believe deep down and very passionately that financial planning and people’s route to financial success is extremely simple. I mentioned the same things before. Spend less than you earn, protect against disaster and invest wisely. Of those, the third one, invest wisely simply means keep your costs low and utilize all the tax advantages you can. Now here in the UK, that means two different kinds of policies really, a pension and an ISA. That’s all most people need. 98% of people just need consistently to savings of those things and they will be fine. [00:56:36] Pete: They need to use multi-asset. What does that mean? How do I explain it? That you need to keep the cost down. What does that mean? What kind of cost? How does it work? Explaining this stuff and teaching people all the time just strikes me as so monumentally obvious that anybody who doesn’t do that, as a matter of course, arguably does not deserve to have the input into clients that we do. We are deeply privileged as a profession to speaking to people’s lives and I think not to do to clients the service of helping them understand everything that we do ought to disqualify us from doing the job. That’s how passionate I feel about this. If we can’t speak in normal language then we should be doing something else. Sorry. [00:57:21] Brad: No. I love the passion and it tells why you’re so good at what you do. I was just thinking everybody’s been to a doctor’s office. [00:58:09] Brad: But in financial services we do the exact opposite. It’s crazy. [00:58:12] Pete: We do. I think it is most benign. It’s simply that we just are so used to using these terms that they are just entrenched and we don’t know we’re doing it. I think that’s hopefully wishing the best on people. I think at its most insidious, we use this kind of language to elevate ourselves into thinking that somehow people will be impressed by that. We are a long way from that kind of world. People now just want to take action. They want to understand what they’re doing and they want to find the shortest route to doing that. And I think by befuddling people with big words, people would just switch off and we don’t deserve for them to do business with us. It’s like thinking people will be impressed by really fancy, really expensive offices or literature. People don’t care about that sort of stuff. These days they think, “Well I’m paying for that.” Now they want simple straight down the line, “Let’s just get it done,” and jargon I think is a barrier to that and we need to just eliminate it. [00:59:25] Pete: We call an ISA, Individual Savings Account. [00:59:28] Brad: So, ISA. So, let’s say we’re – I obviously have no clue what that means but maybe everybody in the UK does. [00:59:34] Brad: So, say, you hit on a topic like that, are you legitimately preparing here’s an analogy I could use on my show to make that very simple for people to use? Is there any framework that you use on different acronyms? [00:59:46] Pete: Yeah. No, I mean, something like an ISA is very well-established but that wouldn’t stop me in each show from saying, “Look, the obvious way to save for your future is with an ISA. That’s an individual savings account and it works like this.” So, it’s not a framework as such. It’s just that let’s, right near the start, assume that people know nothing. But if you deal with that quickly, you won’t turn off the people who do know a little bit more and so it’s not lowest common denominator stuff. You can start there very briefly address that and then move on. Those who need to can press the 30 seconds back button and just get the explanation again, one of the powers of the medium. But then you pick up and you build on it. So, I think building on knowledge over time, one of the benefits of the seasons where I’m operating is you can start with the raw basics. Whatever subject you’re dealing with, these are the raw basics for somebody who knows nothing, start here, and then develop throughout the season. So, I did one recently a season on the great transition into retirement. We start accumulating money and start spending it. That transition is an incredibly complex and nuanced time in people’s financial lives but I started with the raw basics. And then at the end of the season, I answered some of the more technically complex questions that have come in throughout the season. I didn’t balk from dealing with some fairly deep matters there using some jargon terms but explaining them along the way because advisors will use them and people need to understand. So, you can build. That, if anything, is the framework. You can build. Start with the lowest common denominator but build on it. Don’t patronize people but be prepared to meet people wherever they’re at and address it. It comes as a second nature to me, Brad. So, I’m trying to sort of deconstruct it but that’s essentially what needs to be done. Start addressing everybody and then build on it and add complexity all the time. [01:01:42] Brad: Great. All right. Before we get to the questions, I helped you with the SEOs half by accident. By no means am I a podcasting expert so I don’t want anybody to misconstrue that but you gave me an awesome tip. This really helped you with your podcast as far as generating reviews on the show on iTunes and I would love if you could share that for those financial advisors that do run out and start to podcast thanks to this conversation, “This is what I should’ve done at the beginning and I haven’t been doing,” so I’d love for you to share that. Now some people might balk at that because they think it’s a little bit ego massaging but I laugh when they make jokes in their reviews. I laugh with them and I say, “Thank you very much,” and all that sort of stuff, and it becomes a bit more of a conversation even though it’s only me talking because I’m reading out what they say. And they email me back then and say, “Woohoo, I just heard my name on the show. Thanks so much for reading out my review. Please keep going.” And so, you get social proof. You get people doing it so that maybe you’ll read them out. I mean, I get three or four a week maybe so sometimes I read them all out. So, it’s just a great way of adding social proof that there are actually other people out there listening and saying nice things about you and there’s a little bit of rapport with the audience and it was a treat. [01:03:46] Brad: It feels like you are in a conversation because I’ve listened to a few of your shows at the end. I just wanted to deconstruct your framework so I could potentially incorporate it into my show and it feels like you are sitting there joking back and forth with them and I also think it creates this community sense where I’m part of something here. [01:04:03] Brad: As I listen to you interact with the audience. [01:04:06] Pete: And that’s powerful. I would love to deconstruct that as well. There is a magic to podcasting which I think transcends blogging and video. Everybody I talked to about the power of it says, “Really? You think that video is where it’s at?” Because you get the whole picture, right, you get the moving image and you can get facial expressions and things like that. But there is real power in audio as well as the fact that you can listen while you’re doing something else which is a key part of its power. But there is something about talking directly into somebody’s ears and the nuance you can put on your voice. I just talk like I do normally. I talk like I’m talking to you now and my stupid Northern England accent comes across sometimes and people laugh at that, the way I say things. And I mess up my words and I laugh at myself and I just say, “You know, I’m going to say that again because that was rubbish,” and I don’t edit it out. It really is warts and all very normal and people get that. People buy people. It’s a cliché but it works. People like the fact that it’s not actually that polished and people buy it. It’s great. [01:05:09] Brad: Yeah. Well, in the US you sound incredibly intelligent because that you have an accent. I don’t know what it is about the US but it’s like you’re proper and this guy knows what he’s talking about. [01:05:19] Pete: Ironically, in the UK, my accent generally is probably considered to be a bit of a stupid accent. You need a Southeast of England accent which is all jolly good. Yes, that’s excellent. That sort of accent, whereas my accent is your normal sort of the thick person from the north. [01:05:38] Brad: Well the Kansas accent I mean that’s country long drawn out. We talk slow. So, we’re probably in the same boat, buddy. [01:05:45] Pete: You people all sound the same to us though. Unless you’re from New Jersey, you all sound the same. [01:05:55] Brad: So, thanks for joining me. [01:05:57] Pete: Been great to be here, man. [01:05:58] Brad: All right. I’m going to go to my new favorite question. I’ve only asked this or once before but it’s been a funny answer. So, what if something that you would like to have considered absurd 25 years from now? [01:06:10] Pete: What is something that I would like to be considered as absurd 25 years from now? I would love it to be considered absurd that we interacted with computers by mouse and keyboard. Does that answer it? I’d love that – I would say to my wife, “The day they bring out like brain implants for people so that we can just think through our computers, I’ll be first in the queue.” So, I’d love it to be absurd that we interact with our computers by our fingers. I’d love it to be via thought. I’d love it to be absurd that we actually control our own cars on the road. I’d love it to be automated. That’s the sort of thing. I would love it to be absurd that people were scammed by people ringing on the phone. I’d love that stuff to be just eliminated. Really people fell for that? I was speaking to a lady today who gets a call a week from somebody trying to sell her stocks. She is in her 80s. I’d love that to be an absurd anachronism from the early 21st century. These are things I’d like to be absurd and abolished. I’m not sure if that answers the question. [01:07:12] Brad: It does. Elon Musk is working on at least one of those for you. [01:07:16] Pete: The man is a genius. [01:07:18] Brad: He is. When you hear the word successful, who’s the first person you think of and why? [01:07:23] Pete: The first person that immediately springs to mind is Pat Flynn of SmartPassiveIncome.com. I think he’s successful because he has a bit of a motto now, Serve First. He serves his audience. It’s evident that his family is the most important to him so he is the first person that springs to mind because I think he balances incredible content production with the desire to serve his audience while still putting his family first. That strikes me as perfection. [01:07:56] Brad: That’s a good one there. That’s something I strive for myself. It’s not easy. [01:08:00] Pete: Family first. It’s family first always. Yeah. That isn’t easy. There’s plenty of other course in our time but I will have failed if I end up with millions of listeners every month but my kids hate me. I would rather stop everything today and have a great relationship with my daughters and my wife. [01:08:18] Brad: Yeah. What’s the favorite book that you’ve ever read and how did it impact your life? [01:08:24] Pete: Oh my gosh. To narrow that down to one, I’m raised a Christian so without a doubt the book that has had the most impact in my life is the Bible. But other than that, if anybody was to ask me which one book should they read in order to in a way mirror what I’ve done, I previously would’ve sent them to Platform by Michael Hyatt. Now I would send them to Known by Mark Schaefer which is a new book, only out a couple of months ago. It’s now I think the book for marketing for 2017 and beyond. So, that’s in the space that I’m in. In terms of books that have affected me, a fantastic book was recommended to me by Dan Sullivan of Strategic Coach. Now I’ve never done strategic coach but I’ve listened and read pretty much everything Dan Sullivan has ever put out and he recommends a book that’s called the – there it is, it’s just come back to me, The Support Economy: Why Corporations Are Failing Individuals and the Next Episode of Capitalism. It’s a 2004 book. It’s a beast. It’s a big book and it’s pretty meaty but the premise of the book is that people want more and deeper help addressing the things they need to address into the future and give some examples about how that might work. So, very much a book and a look into the future but it’s very encouraging that somebody who provides support every day to the clients, I believe it’s the way it’s going. It’s now not about big corporates and them shoving products down our throat. It’s about supporting clients on a one-to-one basis. Deep support is the essential premise of the book and that’s a fantastic book. I’m glad I remembered that one. That’s a good book. [01:10:11] Brad: Anything from Dan Sullivan is gold. [01:10:14] Pete: Well it is. I mean, he more than almost anybody has identified just what a privileged position we as financial advisors have. The Advisor Century is a great read. Obviously, a lot of his clients are financial advisors but, yes, clients from many different disciplines and he identified financial advisors at being in a unique position of blending what we know about people’s lifestyle, their hopes and desires as well as the financial machinery that they need to put in place to achieve those things. It’s a uniquely privileged position we have and I think we need to understand that more. [01:11:31] Brad: …a great spot to be in. [01:11:34] Brad: I mean, you’re podcasting and people are connecting with you from all over the UK. [01:11:38] Pete: Yeah. You roll with it. It changes and you take advantage, absolutely. It’s a great place to be. [01:11:44] Brad: All right. Last question. You just flown through these. I feel like I need harder questions. [01:11:49] Pete: They feel hard enough to me. [01:11:52] Brad: What is the one piece of advice you could share with the audience that’s led to your success? [01:11:58] Pete: I need to be careful how I word this because I don’t want to swear. It’s not really my way of doing things. But you need to care deeply about everybody you come in contact with. We are in a world which there’s too much facelessness still. I love the fact that social, which as Gary Vaynerchuk would say is just the new word for the internet, has put a face on a lot of big corporates and stuff like that but people still don’t feel cared for. They don’t feel loved and appreciated. I think anybody providing the service that we do as financial advisors or putting out content, it needs to be done from a position of caring for those who are consuming that content or consuming your service. It sounds obvious. We talk about fiduciary responsibility. That’s all great. I think it’s a level above that. I think if you care enough to give up yourself and pour your heart and soul into your business and into your marketing content then the universe will look after you. Certainly, that’s been my experience. I believe if you give and you give and you give, yes, you charge for services, don’t get me wrong. I’m not talking about being in charity necessarily. If you give and give and give, the universe will look after you and it will come back to you in spades. So, whatever your belief system I see that all the time, the way people care and it comes back to them. So, that’s the one word of advice. Actually, give a monkey’s. That’s a UK expression but you get the point. Care passionately about those who consume your content and your services and you’ll be just fine. [01:13:40] Brad: Sound advice. Well, Pete, I want to say thank you. It’s been a fun conversation. [01:13:46] Brad: Anytime you want to chat you let me know, buddy, and we’ll make it happen again but I want to say thanks first of all for all the podcasting knowledge which is hard to come by in financial services, unfortunately at this point. But hopefully, if nothing else, we inspired a handful of financial advisors that listen to this conversation to get out there and start because it’s changed my life and I’ve been doing it a little over a year and I know it’s done the same for you. [01:14:09] Pete: It’s a vast untapped seam. A rich seam that people can mine and, yeah, here in the UK. Clearly there in the US, there are not enough people doing it. People need to hear our message and we’ve got this mechanism for doing it. So, any help I can give to anybody listening to or watching this, Brad, you’ll have my contact details. Get them to tweet me or whatever and get in touch. I’m happy to help. I love talking to people about this stuff. [01:14:37] Brad: Awesome, Pete. Well thank you and I know you’ve already created quite the movement over in the UK so maybe we can bring some of that over to the US as well. [01:14:44] Pete: Absolutely. Thank you so much for having me, my friend. You’re doing great work. Keep going. [01:14:46] Brad: All right. Take care. [01:14:52] Brad: Thanks for checking out the conversation with Pete. I love this one as you guys can tell. There’s a reason Pete’s really good at what he does and so I’m going to steal a page right out of Pete’s book. I’m going to hop out to iTunes right now and pop up a recent review. This one is from AdamBC and Adam says, “As an advisor, I found Brad’s approach to this podcast to be very compelling.” Thank you, Adam. I appreciate it, man. “The mixture of industry rock stars as well as experts from other industries keeps it fresh and thought-provoking. The last 20 minutes of his conversation with David Bach are a gold mine for advisors. Dan Sullivan, Joey Coleman, great stuff.” Thanks so much, Adam, especially for taking a second to write us a note, drop us a review. I really appreciate it. For those of you out there that listen, it’s still humbling to me. I just have an advisor that was in office, John, the other day that swung by and said, “Thanks for putting out the show,” and how he loves it and it’s making an impact on his business. So, as long as we can do that even just for a few of you out there we’ll keep cranking out shows. If you are a listener and you haven’t reviewed the show yet, I’d love if you take a quick second to do so as it really helps me out, helps the show rank on iTunes. To make it easy, we set up a page BradleyJohnson.com/iTunes and be sure to just leave your Twitter handle or however else we can connect with you socially. Besides giving you a shout out here at the end of the show on a future show and reading the review, we’ll also try to give you a shout out. I’ll hop out on Twitter or wherever else I can find you and give you a shout out there as well. So, thanks for listening and we’ll catch you on next week’s show. Take care. This program is provided for informational purposes only. Please keep in mind that not all insurance carriers allow “business through the mail” and there may be registration requirements and limitations for virtual investment advisory services. Producers are ultimately responsible for the use or implementation of strategies and concepts discussed and should be aware of the compliance requirements of any broker-dealer or Registered Investment Advisor with which they may be affiliated, the insurance carriers they represent, federal regulations and state insurance and securities regulations. Investment advisors are strongly encouraged to obtain pre-approval from the broker-dealer and/or Registered Investment Advisor with which they may be affiliated prior to implementing this practice. Results from the use of the concepts and strategies shared by Peter Matthew are no guarantee of your future success.